Stonecast Tableware. 19 Pieces of. Cash on collection is accepted. · Saucers (D 14,5 cm / 5.7"; no strawberries, just outer dec.). – WILD STRAWBERRY –. · Soup / Pudding Bowls (D 15,5 cm / 6.1"; H 6 cm / 2.4"). · Dinner Plates ( D 24 cm / 9.4"). · Side Plates (D 17 cm / 6.7"; 1 with a tiny chip). Churchill Homespun Stonecast Trees Design 2 x side plates in lovely vintage condition. No damage very lightly used. A minor manufacturer imperfection to one plate see last picture. Measure approx 16.75cm wide. As per title and photos. All of these bowls are in excellent condition. The design is from their stonecast range. Designed and made by Churchill. Here for sale is a lovely set of 3 tea plates. The design is from their stonecast range. Designed and made by Churchill. Here for sale is a lovely set of 6 tea cup saucers. 7" diamter side plate. 6 plates left to buy. Priced per plate. Great for a retro interior or country kitchen. Hand painted. WITH PARCEL FORCE FOR £15. Cornfield". Detergent proof. 3 bowls (one bowl missing). CHURCHILL HOMESPUN STONEWARE RANGE - Salt and Pepper cruet set. CHURCHILL HOMESPUN STONEWARE RANGE - Teapot, sugar bowl and milk jug. 15.5cm wide including handle. We hunt high and low to bring you new and used collectables and interesting things. Odd very minor mark but very nice LU181. Probably dates from the 1960s or 1970s. The dinner plate shows a bit of discolouration in the centre. 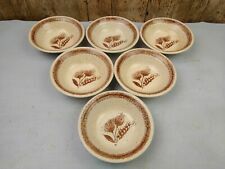 Vintage Set of 6 Coffee Cups, "Trees" , Churchill Homespun, Made in England. They all feature decorative scenes of whimsical trees and birds, in a light brown colour, which contrasts beautifully against the creamy coloured stoneware. Never used so in immaculate condition.